With the release of many of the recent sets, Pokemon has been putting in some obvious archetypes for players to use. Some of the recent examples are Boundaries Crossed with Blastoise/Keldeo EX, Plasma Freeze giving us TDK, Plasma Blast with Virgen, Phantom Forces with Night March, and Primal Clash with Primal Kyogre EX/Rough Seas. With Roaring Skies, Pokemon has once again neatly tucked away a new archetype into Roaring Skies with M Rayquaza EX/Shaymin EX, a deck many in the Pokmeon community expect to be Tier 1. In the first part of the set review I covered the Delta Traits, Trainers, and Special Energy from Roaring Skies, you can check that out here. 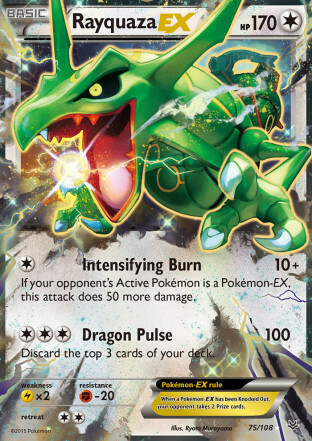 Since writing that article Roaring Skies has officially released and I’ve managed to get in over 100 games in the new format on PTCGO, so there is quite a bit of testing going into my rankings of the Pokemon in the set, which has moved some cards up and down the list slightly from my initial perceptions of their strength. My opinions from the first part haven’t really changed with the testing, although Double Dragon Energy may be better than any Trainer in the set, its definitely one of the strongest Special Energy we have seen in a long time. Wally has been a little bit more difficult to consistently pull off than I thought it would be as well, although I think that can be fixed with finding a better built engine for it. Overall I’m very impressed with Roaring Skies as a set. 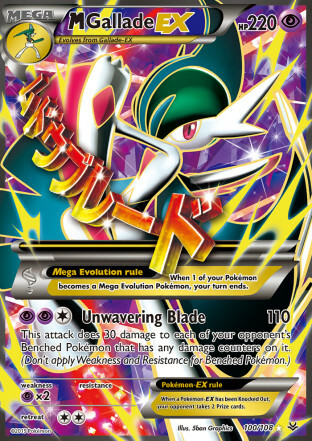 I think it provides a very deep pool of playable cards, very similar to Phantom Forces, although the top line cards are even better in this set, so if there is ever a time to buy boxes, this is it, just try to avoid pulling the awful Thundurus EX that is the only bad ultra rare in the set. Exeggutor is a Stage 1 Grass Pokemon with 120 HP, a Fire weakness, and a 3 retreat cost. Its first attack, Shake It Off, costs [G] and does 20 damage times the number of Colorless Pokemon your opponent has in play. Its second attack, Seed Bomb, does 80 damage for [G][C][C]. Shake It Off probably won’t be a super effective attack, but it could end up being solid against M Rayquaza EX decks. The attack can theoretically reach 220 damage with Silver Bangle and Hypnotoxic Laser, but I wouldn’t count on that occurring very often. What the attack could be effective in doing is taking KO’s on your opponent’s Shaymin EX. If between Rayquaza lines, Shaymin EX, and Altaria your opponent gets to 6 Colorless Pokemon in play, you can Lysandre KO Shaymin EX’s, even without damage modifiers. Its second attack could serve as a decent counter to Seismitoad EX as it can score a OHKO if you manage to get a Muscle Band or Silver Bangle on Exeggutor before the first Quaking Punch of the game, although that would be unreliable. A lot of M Rayquaza EX decks are already playing both Exeggcute PLF and Grass Energy, so fitting Exeggutor in as a non-EX attacker could be a viable option for that deck, although it’s hard to see anywhere else where Exeggutor fits at the moment. 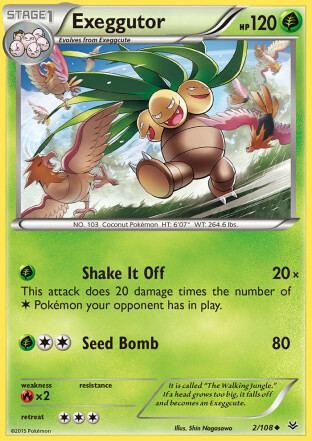 It also appears that Pokemon has caught onto the Taylor Swift fever, naming one of Exeggutor’s attacks off of the name of Taylor Swift’s 2014 hit single, Shake It Off from her 1989 album. Only time will tell, but maybe we will see Taylor winning some more City Championships with Exeggutor next season. It’s very difficult seeing Exeggutor picking up a ton of play just because it would be very rare for a deck that plays almost exclusively Colorless Pokemon dominating the meta game to the point where Exeggutor is doing enough damage. As it doesn’t hit the Pokemon it is countering for weakness, it isn’t the most effective counter. However, in decks that already play Exeggcute, I think it can find a very niche role for being a Shaymin killer against M Rayquaza EX/Shaymin EX. While Exeggutor may not find its way into many players’ competitive decks it is surely a card that will end up in many collections as it wins over the hearts of the people. Dustox is a Stage 2 Grass Pokemon with 130 HP, the Delta Plus Trait, a Fire weakness, and a 1 retreat cost. Its first attack, Flap, costs [G] and does 20 damage. Its second attack, Wind Shard, costs [G][C][C] and does 50 damage to one of your opponent’s Pokemon. 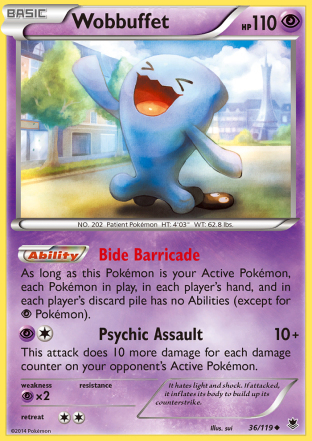 This is obviously not a great standalone card, but it has the most intriguing Plus trait to me as its attack is a snipe attack, so it can easily pick off low HP Pokmeon for two prizes as well as snipe damaged EX’s that your opponent is trying to hide on the bench. 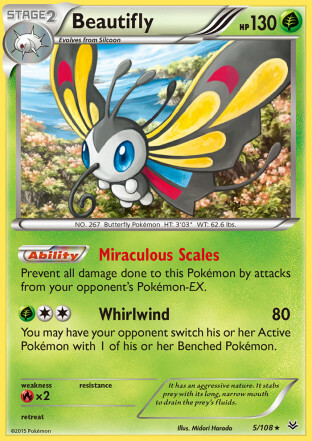 The only reason that Dustox really was able to sneak onto the list is because it has a partially shared evolution line with Beautifly, a card that could form the basis of its own deck at some point down the line. Both Dustox and Beautifly share a Basic Pokemon in Wurmple before diverging into different Stage 1’s with Silcoon and Cascoon (Dustox evolves from Cascoon). 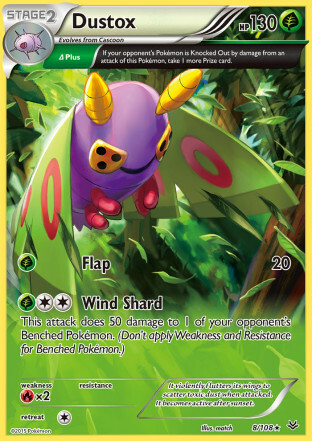 Therefore, you would be able to slip a thin Dustox line into Beautifly decks to take advantage of the Delta Plus Trait. Salamence is a Stage 2 Dragon Pokemon with 160 HP, a Fairy weakness, and a 4 retreat cost. 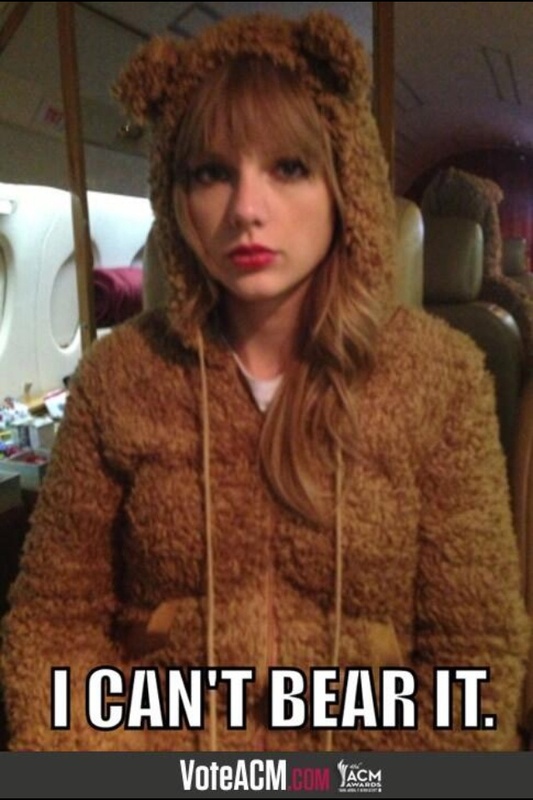 It has three attacks. The first, Shatter, costs [R] and does 60 damage and discards any Stadium card in play. Its second attack, Power Howl, costs [W][C][C] and does 20 damage times the number of cards in your opponent’s hand. 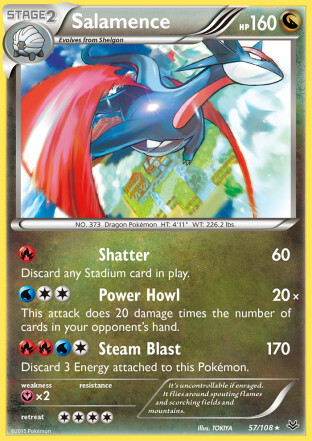 Its third attack, Steam Blast, costs [R][R][W][C] and does 170 damage and you discard 3 Energy attached to Salamence. All of these attacks can be powerful in the right situation. Its Energy costs works really well with the Dragon support, allowing it to be accelerated to with Reshiram to fulfill the Fire costs, and Double Dragon to fill in the rest. While this card features three good attacks, unfortunately it isn’t very strong in the current format as it is still very difficult to get Stage 2 Pokemon into play. I’m holding out hope that something changes to make Stage 2’s more easy to get into play because cards like this are strong when you can get them into play. Jirachi is a Basic Metal Pokemon with 70 HP, a Fire weakness, a Psychic resistance, and a 1 retreat cost. It has two attacks. Its first attack, Diminutive Desire, costs [M] and lets you look at the top 7 cards from your deck and choose one of those cards and put it into your hand and then shuffle your deck. Its second attack, Doom Desire, costs [M][C] and makes you discard all Energy attached to Jirachi and then the Defending Pokemon is knocked out at the end of your opponent’s next turn. 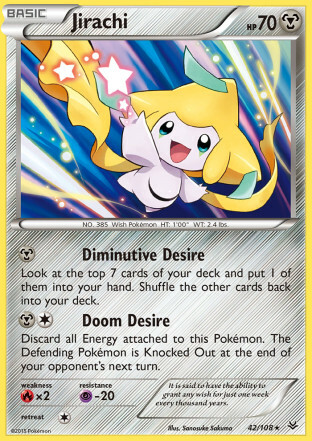 Diminutive Desire makes Jirachi a very solid starting Pokemon in Metal decks as it probably can fetch you a Supporter if you don’t have one in hand already, or if you already have a Supporter, you can take a card that can be used to further your strategy. Doom Desire will be a hard attack to make effective, but I believe it can be a game winning attack when used in the right situations. The effect of the attack can be played around by retreating the Defending Pokemon, or using some other switching effect. I think it will be most effective when your opponent is down to two prizes left if you can play an N right before you use Doom Desire. With a small hand to work with, your opponent may not draw into a switching effect and may be left with something that can’t retreat and lose a Pokemon to Doom Desire as a result. Additionally, just forcing a retreat from your opponent could disrupt your opponent’s strategy enonugh to get you a win. If my understanding of the knockout rules are correct, in a scenario where your opponent only has one prize remaining, Jirachi could trigger sudden death games if both it and your opponent’s Pokemon are knocked out at the end of their turn. Right now there are a lot of switching effects, but with Float Stone and Keldeo EX rotating soon, Jirachi will have more opportunities to be successful. Update: A new compendium ruling states that no sudden death game would trigger from Jirachi. The ruling says that Jirachi would be knocked out before the end of your opponent’s turn while the other Pokemon would be at the end, so as soon as Jirachi is knocked out, the game ends. Altaria is a Stage 1 Colorless Pokemon with 90 HP, a Lightning weakness, a Fighting resistance, and a one retreat cost. Its attack, Wing Attack, costs [C][C] and does 30 damage. It has an Ability, Clear Humming, which makes it so all of your Colorless Pokemon have no weakness. 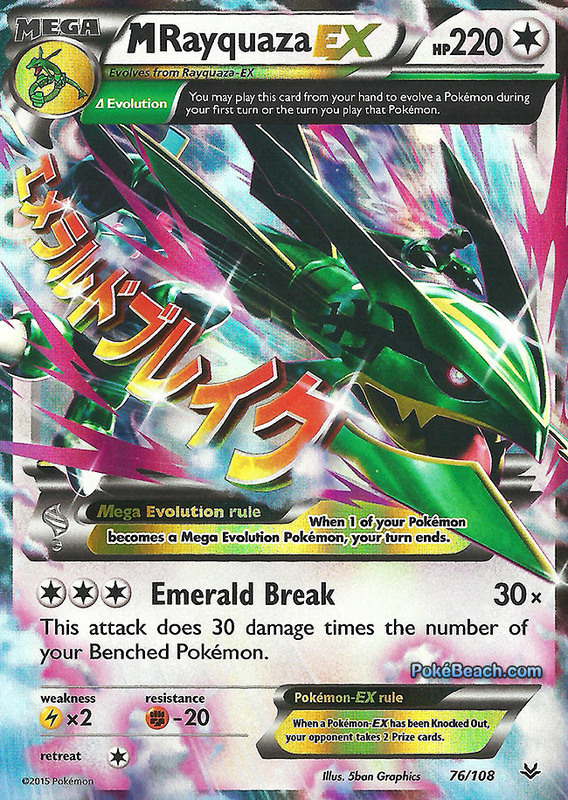 This is very clearly made with the M Rayquaza EX deck in mind, as M Rayquaza EX has a Lightning weakness. You will definitely want to play at least a 1-1 line of this Altaria in your M Rayquaza deck, otherwise it will be very easy for Raichu and Night March decks to beat you by hitting your M Rayquaza EX for weakness. I’m not sure many other Colorless Pokemon will see play, but Altaria would be useful with any new Colorless Pokemon that get released in the future too. Altaria is a Stage 1 Dragon Pokemon with 80 HP, a Fairy weakness, and a one retreat cost. It has two attacks. 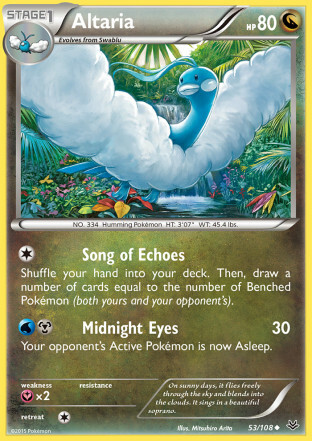 The first, Song of Echoes, costs [C] and lets you shuffle your hand into your deck and draw cards equal to the number of benched Pokemon in play. The second attack, Midnight Eyes, costs [W][M] and does 30 damage and puts the Defending Pokemon to sleep. Song of Echoes is the equivalent of using your attack to get the effect of Colress, which after both players begin filling their benches is generally one of the best Supporters we have. 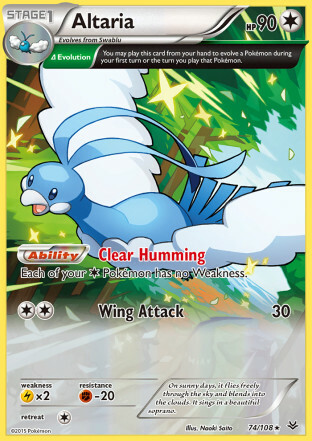 Both M Rayquaza EX and Dragon decks have there reasons to be running other Altaria cards, so you could already have Swablu in your deck, so you can play one of these Altaria to gain access to Song of Echoes. The reason you would want to play one of these is because cards like Wobbuffet, Seismitoad EX, and Trevenant XY can disrupt the usefulness of Shaymin EX for draw support. By playing Altaria, you now have an attack you can use to draw into resources to keep things going against these cards. It probably isn’t a card you want to run early on, but if the format develops with more counter decks running Wobuffet it would be a solid inclusion for M Rayquaza decks. Banette is a Stage 1 Psychic Pokemon with 90 HP, the Delta Evolution Trait, a Dark weakness, a Fighting resistance, and a 1 retreat cost. 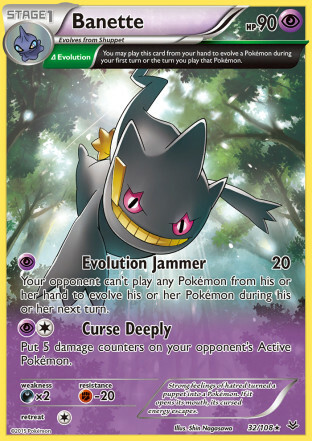 Banette has two attacks, the first, Evolution Jammer, costs [P] does 20 damage and prevents your opponent from playing a Pokemon from their hand to evolve one of their Pokemon. Its second attack, Curse Deeply, costs [P][C] and lets you place 5 damage counters on your opponent’s Active Pokemon. With the Delta Evolution trait, you can evolve into Banette on your first turn of the game, and if you’re going second, you can use Evolution Jammer on your first turn of the game. Preventing evolution is a very strong effect and can completely shutout evolution based decks out of the game entirely. Sadly for Banette, Basic Pokemon still rule the format. Seismitoad EX, Landorus EX, Yveltal EX, Night March Pokemon all don’t need to evolve, and M Rayquaza EX has Delta Evolution, so it can evolve before you get to use Evolution Jammer. Additionally, evolution decks can play around Banette if they feel the need to. Both Wally and Evosoda both search out and evolve Pokemon from the deck, so playing either of those cards can get around Evolution Jammer. Combining these two things, I don’t think Banette will ever be a dominant force in the meta game. It might be a great sneak play during more localized tournaments if evolution decks are popular in that meta and players aren’t expecting it, but anytime players are trending towards Basic decks or know to expect it, it won’t be effective. Beautifly is a Stage 2 Grass Pokemon with 130 HP, a Fire weakness, and a free retreat cost. Its attack, Whirlwind, costs [G][C][C] and does 80 damage and gives you the option of having your opponent switch their Active Pokemon. It has an Ability, Miraculous Scales that prevents damage from your opponent’s Pokemon EX. With the impending rotation we will likely lose both of our current Safeguard Pokemon. Beautifly brings something different to the table from Sigilyph and Suicune in that it is a Stage 2 meaning that its Safeguard effect can’t be shutoff by Silent Lab and Garbodor will likely be rotating in a few months limiting your opponent’s EX attacking options to just EX’s with shred attacks. Miraculous Scales is a little bit weaker of an Ability than Safeguard is, as it only prevents damage, similar to Pyroar, and not effects of attacks like Sigilyph and Suicune do. I think the attack really works well being on a Safeguard Pokmeon as it has an element of disruption to it. Having a partially shared evolution line with Dustox is good, especially since you can send something to the bench with Whirlwind and then snipe it with Dustox. I don’t think it should see immediate play, but these types of Abilities are usually good, so I think it will find a format to be effective in at some point. Dragonite is a Stage 2 Dragon Pokemon with 150 HP, a Fairy weakness, and a 3 retreat cost. Its attack, Mach Press, costs [G][L][C] and does 80 damage and has you flip two coins and if both are heads the Defending Pokemon is paralyzed. It has an Ability, Max Wind, that lets you heal all damage off of one of your Pokemon when you play Dragonite from your hand to evolve one of your Pokemon. In Pokemon, we get two types of formats. Some formats are highly reliant on OHKO attacks, while other formats are more reliant on 2HKO’s and other setup damage. 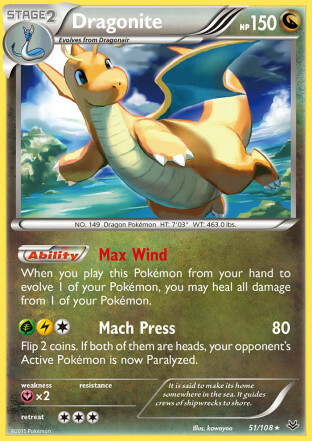 In any format that isn’t dominated by OHKO attacks, Dragonite should be a very strong option for healing off your Pokemon. What makes Max Wind so good compared to some other healing effects in the game right now is that it doesn’t make you lose all of your Energy, which means you won’t lose your board state development by healing off one of your Pokemon. One potentially devastating combo that could be played immediately is pairing Dragonite with Primal Groudon EX and Focus Sash. Primal Groudon EX doesn’t need too many attacks to win a game, so if you can keep one alive for some extra turns with Focus Sash and evolving into Dragonite a couple times that could be all you need to win a game. Deoxys is a Basic Psychic Pokemon with 110 HP, a Psychic weakness, and a 1 retreat cost. Its first attack, Close Encounter, costs [C] and let you draw two cards. It can be used on the first turn of the game. Its second attack, Overdrive Smash does 30 damage, and then during your next turn the attack does 60 more damage. Close Encounter is one of the two cards in the set that can break the first turn attacking rules allowing you to attack going first. 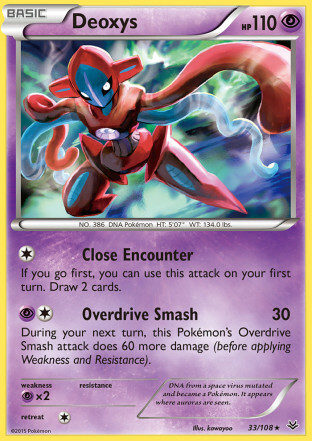 These setup type attacks haven’t been seeing much play as of late, but Deoxys is setup well to break the mold by being able to attack going first as well as being able to take advantage of Dimension Valley, allowing you to use Close Encounter while also using your Energy attachment for the turn to start powering up a more significant attacker. Overdrive Smash is an okay attack as well. In Psychic decks you can use it going second on your first turn of the game to do 30-60 damage based on your damage modifiers. Then if you use it again, it can do anywhere from 90-120 damage. If you attack with Overdrive Smash while using a Silver Bangle for both attacks you can finish off 180 HP EX’s on the second turn of the game. I think Deoxys will be a staple for any Psychic deck with Dimension Valley moving forward. Togekiss is a Stage 2 Fairy Pokemon with 130 HP, the Delta Evolution Trait, a Metal weakness, Dark resistance, and a 1 retreat cost. Its attack, Fairy Wind, costs [Y][C][C] and does 60 damage. 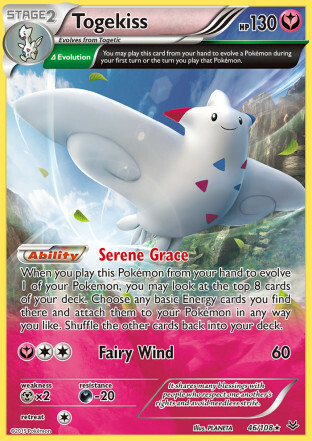 It has an Ability, Serene Grace, which lets you look at the top 8 cards of your deck when you play Togekiss to evolve one of your Pokemon from your hand and then attach any basic Energy cards that you find there to your Pokemon in any way you like. Thanks to the Delta Evolution Trait, you can evolve into Togekiss on the second turn of the game without using a Rare Candy. You can also evolve into Togekiss on the first turn of the game if you use a Wally to evolve a Togepi into Togetic on your first turn. 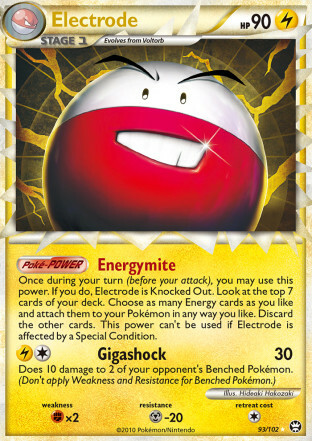 The Ability is somewhat similar to Electrode Prime’s Energymite Poke-Power which was also able to attach Special Energy to Pokemon, but at the cost of knocking itself, and it also only looked at the top 7 cards of the deck. Electrode was somewhat successfully played in the HGSS-NVI format in the CaKe and LaKe decks with Cobalion, Kyurem, and Landorus from the Noble Victory set. Only being able to grab basic Energy, Togekiss probably won’t be able to replicate as versatile of a deck. The Electrode decks were somewhat unreliable, but the energy acceleration was still powerful enough to create a good deck. I would fear with Togekiss that you might have to cut back some on Energy count to allow yourself to fit in a Stage 2 line. I don’t think going for an early game Togekiss will be worth going for. I do think it has some good mid to late game potential, especially when that Item that shuffles 5 basic Energy cards back into your deck gets released. One issue with Togekiss is that there is a lot of Energy acceleration in the format already, and a lot of the acceleration is part of the XY sets meaning it won’t be rotating out anytime soon. Even the types without very strong acceleration (Fighting and Water) have access to things like Alpha Growth and of course Mega Turbo for their Mega Pokemon. With so much quality Energy acceleration already in the format, it may be difficult for Togekiss to see play early in its lifespan. If Pokemon stops printing so many good Energy accelerators and the current ones rotate out, Togekiss could become a much more attractive acceleration option. Nonetheless, the Energy acceleration it does provide is very strong, so at some point I think a very strong deck will get built around this card. It’s just a matter of finding a good attacker to pair it with that doesn’t already have better acceleration. M Gallade EX is a Psychic Mega Pokemon EX with 220 HP, a Psychic weakness, and a two retreat cost. Its attack, Unwavering Blade, costs [P][P][C] and does 110 damage plus 30 more damage to any of your opponent’s benched Pokemon that has any damage counters on it. Unwavering Blade is an attack that has a lot of potential. At its best it is basically a super Night Spear, doing more damage to the Active Pokemon and hitting more benched Pokemon. Even if you’re not hitting the bench, 110 damage is still decent. With Dimension Valley in play you can attack with M Gallade for just two Psychic Energy and you can also accelerate to it with Mega Turbo. The tricky part of using M Gallade EX will be figuring out how to get damage on your opponent’s benched Pokemon. I think I would want to use an Ability instead of an attack to put that damage on so I can get up and attacking with M Gallade as soon as possible to put maximum pressure on my opponent’s field. I think Forretress FLF is the best partner for M Gallade. 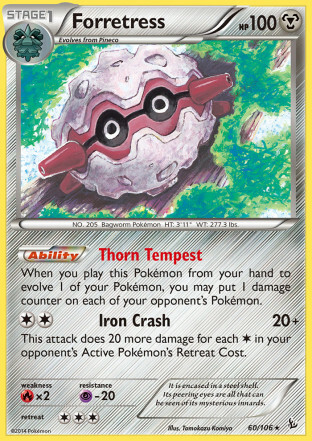 Its Thorn Tempest Ability puts 10 damage on each of your opponent’s Pokemon when you play Foretress from your hand to evolve one of your Pokemon. Playing Foretress can spread damage to all of your opponent’s Pokemon on the second turn of the game allowing you to maximize damage output with M Gallade EX on turn 2. This should be superior to Crobat PHF as the Golbat and Crobat can only place damage on one thing at a time and also because the Foretress line will take up less space in the deck. One advantage Crobat might have is that it wouldn’t be disrupted by Wobuffet, which would be a solid starter Pokemon for Psychic decks to disrupt your opponent’s setup. However, Forretress can still work with Wobuffet just by removing the Wobuffet from the active position. I think a M Gallade deck needs to be taken a step further and add some way to move the extra damage around. 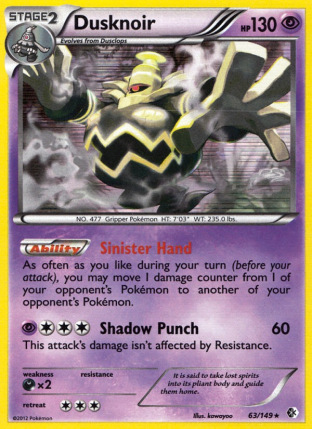 The best option for the next few months will be Dusknoir BCR, which gives you free reign to move damage counters around your opponent’s field in any way you like. Without playing damage modifiers, I feel as though you will just end up with damage building up and being meaningless. This would turn into a very similar deck to the Darkrai EX/Dusknoir deck that has done well in the past, it would just do more damage. Mr. Mime will be an annoyance for M Gallade, as you really want to have Dimension Valley in play to lessen the attack cost and trying to use Silent Lab would probably be awkward in the deck. I think a Dusknoir based version would deal with Mr. Mime easily as you can just move damage to it after one attack with M Gallade to knock it out, but if you didn’t play Dusknoir you would be dependent on using Lysandre to knock it out, and hitting a Mr. Mime for 220 damage isn’t the most efficient use of your damage. Absol is a Basic Dark Pokemon with 100 HP, a Fighting weakness, a Psychic resistance and a one retreat cost. Its attack, Mach Claw, does 30 damage for [D][C] and isn’t affected by resistance. 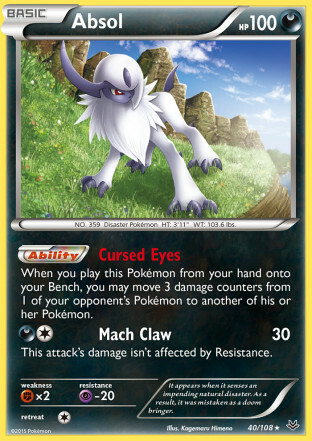 It has an Ability, Cursed Eyes, which lets you move 3 damage counters from one of your opponent’s Pokemon to another one of their Pokmeon when you play Absol from your hand onto your bench. Two factors that have a large outcome on Pokemon games is 1.) Being able to hit certain damage numbers in order to score knockouts and 2.) Using your damage as efficiently as possible. Absol is a card that helps to accomplish both of these goals. For example, a deck like Zoroark can now get to 210 damage with the aide of Sky Field and Silver Bangle. However, that won’t be enough damage to OHKO a M Rayquaza EX. So after you hit a M Rayquaza, you won’t need to hit it that hard to knock it out. So what you can do is play down some Absol to move damage to your opponent’s other M Rayquaza’s. Those Pokemon now have 30 damage on them and you just need to hit for 190 damage with Zoroark for the KO. In this instance, Absol isn’t actually doing that much, just moving 60 damage, but just moving that small amount of damage would help push the game into Zoroark’s favor. Another way that Absol could be used is to complete perfect lock situations. Take a Seismitoad EX deck that has its opponent’s Active Pokemon poisoned. With Virbank City Gym in play and a Muscle Band attached to Seismitoad EX, the damage starts at 80, then is 110 coming back into your turn, and then would be up to 190 after your turn. That is good to knockout both 170 HP and 180 HP EX’s. However, if you play down an Absol to move 30 damage off of that Pokemon then it will be at 160 damage headed back into your opponent’s turn. If they can’t get it out of the Active, then what happens is it is knocked out going back into your turn and then you can play a Hypnotoxic Laser to poison and potentially put to sleep the new Active Pokemon before it gets a chance to attack you. Banette is a Stage 1 Psychic Pokemon with 80 HP, a Dark weakness, Fighting resistance, and a one retreat cost. Its attack, Psyshot, costs [P][C][C] and does 60 damage. Its Ability, Tool Concealment, says that each Pokemon Tool in play has no effect. Tool Concealment is a very strong Ability and taking away the effects of Tool cards can completely change the look of a game. Some Pokemon may miss their knockouts because they’re no longer getting the damage needed for knockouts. A Pokemon might get left stranded in the Active Spot because its Float Stone is no longer working. Your opponent put a Head Ringer on your Pokemon? Not a big deal, with Tool Concealment you can attack for your normal Energy cost again. Most Mega decks will be disrupted as well as their Spirit Link cards will no longer work. 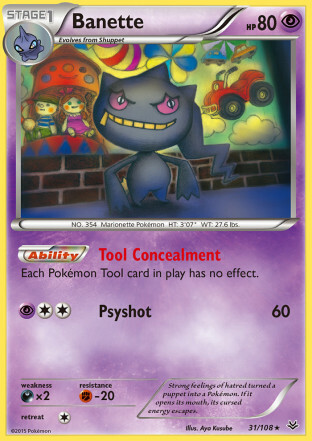 I don’t really know what types of decks this goes in yet, but using Pokemon Tools is such an important part of current strategies that Banette will certainly find itself in some decks and will do a good job of disrupting opponent’s strategies. M Latios EX is a Mega Dragon Pokemon with 220 HP, a Fairy weakness, and a free retreat cost. Its attack, Sonic Ace, costs [W][P][C] and does 120 damage to one of your opponent’s Pokemon and you discard all Energy attached to M Latios. As M Latios is a Dragon Pokemon it can take advantage of Reshiram for Energy acceleration as well as use Double Dragon Energy. As it is a Mega Pokemon, it can also use Mega Turbo for further acceleration. Basically, with multiple Energy acceleration options it is really easy to power up M Latios to attack in one turn, so you can get it going fast. The obvious role of M Latios will be as a bench sitter killer. Shaymin EX figures to be an extremely popular card in the upcoming format and M Latios can easily pick off the Shaymin EX’s on the bench for two easy prizes. I wouldn’t want to build a deck entirely around M Latios, but it’s still a really good card in anything already playing Double Dragon Energy. While its range of effective use is somewhat limited, it is still the best Shaymin killer in the game, and Shaymin EX will be one of the most played cards for the next couple years so M Latios will have plenty of opportunities to be an impact card on the format during that time frame. This is where things get really jumbled. The next set of cards all interact with each other (as well as the previous one) and are all good in a large part of how they can take advantage of each other. These cards are all better because the other ones exist. Latios EX is a Basic Dragon Pokemon with 170 HP, a Fairy Weakness, and a 2 retreat cost. Its attack, Fast Raid costs [P] and does 40 damage and can be used on the first turn of the game. Its second attack, Light Pulse, costs [W][P][P][C] and does 110 damage and prevents all effects of attacks except for damage done to it during your opponent’s next turn. Just looking at First Raid on its base, it can do 60 damage with a Muscle Band. This is good to knockout some low HP Basic Pokemon like Pikachu, Swablu, Pumpkaboo, Joltik, and Eevee. 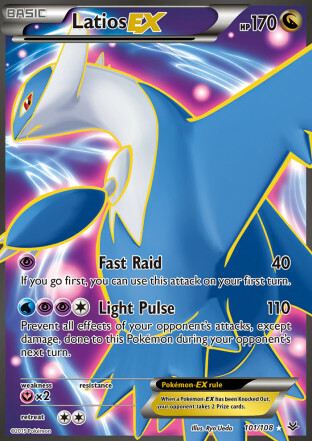 As its attack cost can be fulfilled with Double Dragon Energy, I think you have to play at least one Latios EX in any deck that already plays Double Dragon Energy. It is fairly easy to get into on the first turn of the game thanks to Dragon Road, and searching for the Double Dragon Energy isn’t too much different than it was hunting for the Double Colorless Energy to take donks with Tornadus EX and Mewtwo EX in the past. I know just from my early testing games being able to take knockouts against Night March and Flareon decks on the first turn of the game is very strong, and if you have proper support behind Latios EX that can be enough to put those decks in too large of a hole to dig themselves out of. You can even build around the donk strategy further. With Hypnotoxic Laser and Virbank City Gym you can get the damage up to 90 and to push the damage even further on the first turn of the game you can play Altaria with Wally to get 110 damage on the first turn of the game. This is an important damage number to hit as that is what you need to OHKO a Shaymin EX, which will be one of the most played cards in the new format, so lone Shaymin starts won’t be too uncommon. Being able to put early pressure on opponent’s and steal games with donks will be a huge advantage for Dragon decks, especially since they have such strong attackers to back Latios up with. Hydreigon EX is a Basic Dragon Pokemon with 180 HP, a Fairy weakness, and a 3 retreat cost. Its attack, Shred, costs [P][D][C] and does 80 damage and goes through all effects on the Defending Pokemon. 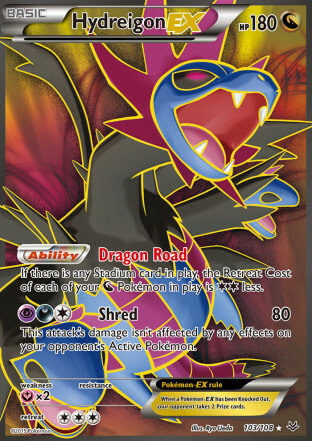 Its Ability, Dragon Road, reduces the retreat cost of Dragon Pokemon by 2 when there is a Stadium Card in play. Simply put, Hydreigon EX is the glue that really holds Dragon decks together. Its Dragon Road Ability stacks, which means if you have two Hydreigon EX in play you are reducing your retreat cost by 4. Usually you just need one Hydreigon EX in play given the retreat costs of most of the good Dragon cards, but you can play a second if you’re playing more Dragon Pokemon with heavier retreat costs or want to give Hydreigon EX free retreat itself. The free retreat obviously combos well with Reshiram to replicate the free retreat CMT got with Skyarrow Bridge in 2012, but it’s especially strong in a format where Seismitoad EX will be a major player. Having full mobility against Seismitoad EX is one of the keys to having a solid matchup against them and Hydreigon EX allows Dragon decks to do that well. Against Seismitoad decks you’r able to easily able to get into your Reshiram and from there you can just sit behind a Reshiram and accelerate with Turbo Blaze to get Energy flowing to outpace the Toad players Crushing Hammers. Its attack, Shred, is a huge boon for Dragon decks as well. Most decks tend to be EX heavy, Dragon decks are no exception to this, so having a built in option for dealing with Safeguard is very strong. With a Muscle Band, Hydreigon EX will OHKO a Sigilyph PHF or Suicune PLB and can 2HKO an Aegislash EX. Reshiram is a Basic Dragon Pokemon with 130 HP, a Fairy weakness, and a 2 retreat cost. Its attack, Bright Wing, costs [R][R][L][C] and does 110 damage and makes you discard a Fire Energy attached to Reshiram. Its Ability, Turboblaze lets you attach a Fire Energy from your hand to one of your Dragon Pokemon when Reshiram is Active once per a turn. When you combine Reshiram, Double Dragon Energy, and Mega Turbo, Dragon decks have some of the strongest Energy acceleration in the game right now. A lot of Dragon Pokemon Have [X][Y][C] attack costs, letting you power them up in one turn with attachments from Turbo Blaze and Double Dragon Energy. Reshiram’s attack isn’t that great, but it is strong enough to knockout 130 HP Pokemon with Muscle Band, or even 170 HP EX Pokemon if you have two Altaria in play. 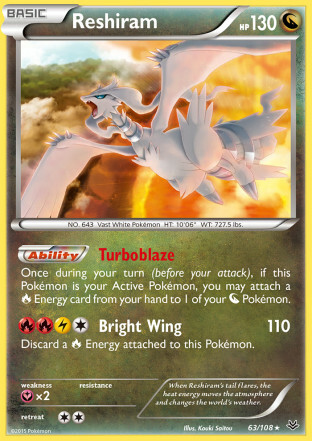 The four Energy cost can be met in one turn even just by using a Turboblaze to a benched Reshiram, retreating into that benched Reshiram, using Turboblaze to itself and then attaching a Double Dragon Energy. While it’s easy enough to power up I think you would generally want to avoid attacking with Reshiram because most of the other Dragon attackers you have at your disposal are much stronger. CMT, a deck that used a similar Energy acceleration strategy with Celebi Prime and Mewtwo EX was a solid Tier 1 deck until Celebi Prime rotated out of the format. There are plenty of strong attackers to pair with Reshiram, so I expect Reshiram decks to be very good, both immediately and into the future. M Rayquaza EX is a Mega Dragon Pokemon with 230 HP, the Wild Delta Trait, a Fairy weakness, and a 2 retreat cost. 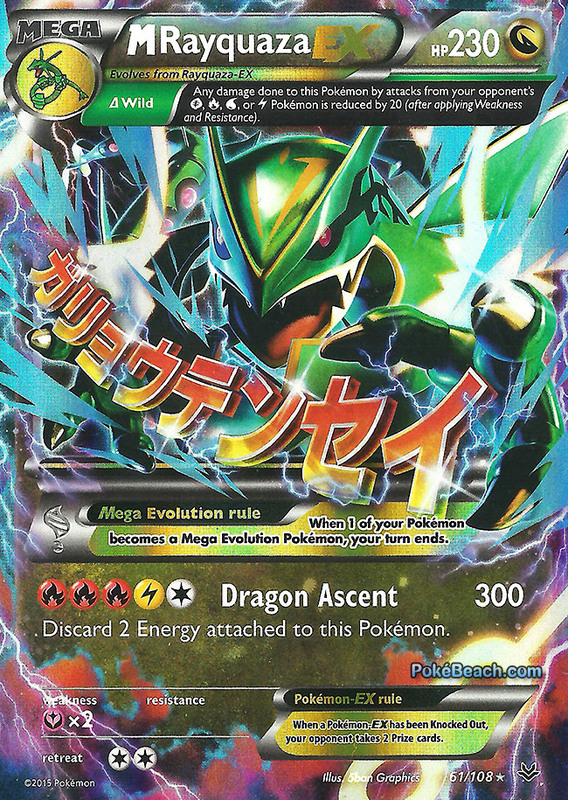 Its Dragon Ascent attack does 300 damage for [R][R][R][L][C] and forces you to discard two [R] attached to M Rayquaza. I feel as though Pokemon looked at some of the early designs for Mega Pokemon and recycled some of the older concepts and altered them into cards that you’re actually able to play. Primal Kyogre EX felt like a better version of M Blastoise EX and now this M Rayquaza EX is cut from the same cloth as M Charizard EX, just with a much better negative effect on the attack that is easier to build around. Having a Spirit Link also helps make it more playable. Generally a 5 Energy attack would be too difficult to play, but M Rayquaza has loads of Energy acceleration options to take advantage of. It can use Reshiram, Double Dragon Energy, and Mega Turbo to power itself up. 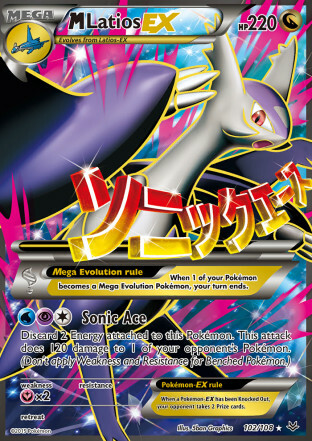 This card will be paired with Reshiram to form the spiritual successor to CMT. With all the acceleration options it can easily setup a turn 2 Mega Rayquaza and when you’re swinging for 300 damage with 230 HP you can do a lot of damage to your opponent’s Pokemon and put a ton of pressure on their field. They put a Dragon type Rayquaza EX in the set, so you have a Basic that you can accelerate to with Reshiram before you even evolve. Its attacks are Dragon Claw for [C][C] and that does 30 damage and then Dragon Strike for [R][R][L][C] and that does 130 damage and you flip a coin, if tails you can’t use Dragon Strike on your next turn. Dragon Strike is a decent attack that is fairly easy to setup on your first turn of the game, so you can put some pressure on your opponent with Dragon Strike when you go second. Alternatively, you could also include a copy of the Colorless M Rayquaza to attack for even more damage on your first turn of the game. Both M Rayquaza’s share Spirit Links, so you can easily play a copy of that one without altering your core strategy any. I’m not sure how much impact Wild will actually have overall, but it is a nice little add on to an already strong Pokemon and over the course of many tournaments I’m sure it will be responsible for preventing a knockout in at least some of those games. M Rayquaza EX is a Mega Colorless Pokemon with 220 HP, the Delta Evolution Trait, a Lightning weakness, and a Fighting resistance. Its attack, Emerald Break, costs [C][C][C] and does 30 damage times the number of Pokemon on your bench. This set was created very much in mind with creating an archetype around M Rayquaza. 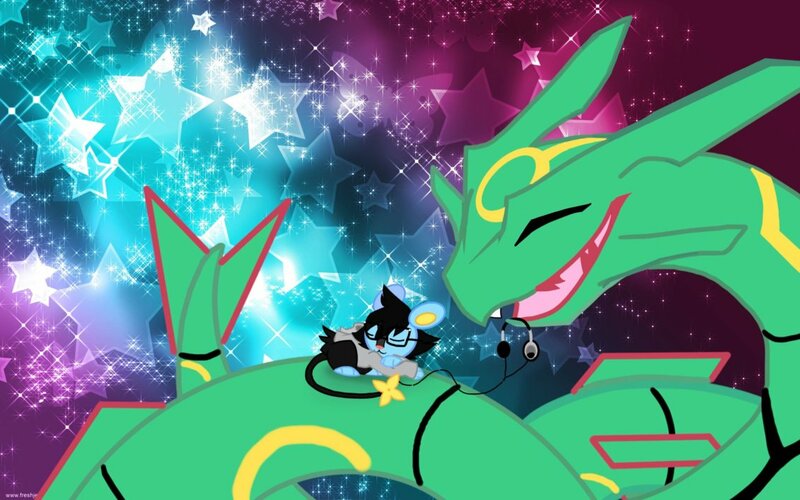 The most notable card in the new set for aiding M Rayquaza is Sky Field, which lets you have 8 benched Pokemon, which means that M Rayquaza can hit for 240 damage with a full bench when Sky Field is in play. With Delta Evolution you can evolve into M Rayquaza on the first turn of the game and you can accelerate into it with Mega Turbo, so you can attack with it when you go second. M Rayquaza is easily the strongest attacker in the game, being able to OHKO all current Mega Pokemon in one hit, as well as everything except Wailord EX, which you could even OHKO if you got a Muscle Band on M Rayquaza. M Rayquaza will have a polarizing effect on the meta game because its attack is so strong. Some old strategies that were popular will be too weak to deal with M Rayquaza and disruption strategies based around Item lock, Energy denial, and Ability lock will surely see an increase in play to help deal with the deck. Countering M Rayquaza on weakness won’t be easy to do, as they put the Altaria in the set which takes away weakness from Colorless Pokemon and it has the Evolution Trait as well, so it can be there protecting M Rayquaza from weakness on the first turn of the game. This means that playesr will have to use Garbodor to shutoff Abilities if they want to hit M Rayquaza for weakness if the M Rayquaza player plays Altaria in their deck. The Colorless Rayquaza EX is an okay card as well. Its Intensifying Burn attack costs [C] and does 10 damage, plus 50 more damage if the Defending Pokemon is an EX which is a solid one Energy attack when used against opposing EX’s. Its second attack, Dragon Pulse costs [C][C][C] and does 100 damage at the cost of discarding the top 3 cards of your deck. You don’t want to be attacking with Rayquaza EX and want to immediately evolve into M Rayquaza EX, but it’s nice that the pre-evolution is at least somewhat usable for those odd situations where you’re forced to attack with it. 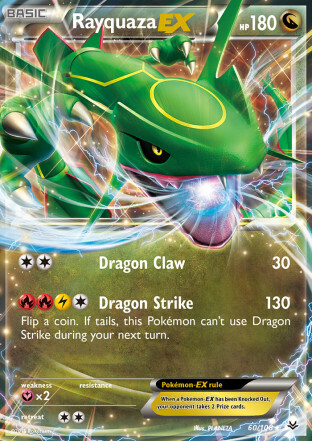 The most interesting aspect of M Rayquaza to me is that it is a Colorless Pokemon with an entirely Colorless attack cost, which means decks can be built around it using pretty much every other type of card in the format. Mewtwo EX is the only card that can compare in its versatility of deck types it could be played in, but it is nowhere near as strong of an attacker as M Rayquaza is. The current builds for M Rayquaza are very streamlined choosing to typically play a 4-3 M Rayquaza line along with 4 Shaymin EX and then some type of Support Pokemon to finish up filling up the bench. Some popular inclusions for this role are Exeggcute PLF, Exeggutor ROS, Leafeon PLF, Raichu XY, Altaria ROS, Mr. Mime PLF, and Virizion EX. This is just scratching the surface of what the card can do and I would be shocked if this is all we saw M Rayquaza getting paired with just within this one format. It can be played with so many other kinds of Support that I wouldn’t be surprised if players find better ways to play the card than the simplistic speed builds that have been being built thus far. 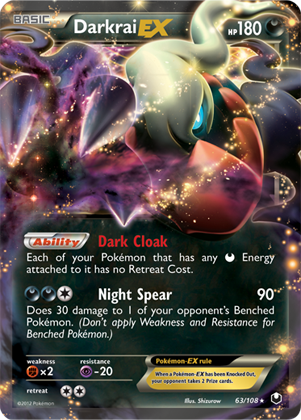 I think an example that we saw of this already was Darkrai EX during the last quarter of the 2011-2012 season. Most players realized that Darkrai EX had a lot of potential, but no one quite knew what was the best way to play Darkrai EX. The Darkrai decks that were seeing play during Spring Battle Roads were Darkrai/Tornadus EX, Darkrai/Weavile, Darkrai EX/Terrakion, Quad Darkrai EX, and Speed Darkrai with just Smeargle and Darkrai’s. Later, the Hammertime variant of Darkrai popped up after Esa won Finland National’s with the deck. The most winning version of Darkrai during Spring Battle Roads that year was Darkrai EX/Tornadus EX, which unsurprisingly was the version of the deck that people initially hyped and first built. However, that was nowhere close to actually being the best Darkrai variant. The best Darkrai variant really didn’t have a coming out until Jay Hornung finished 3rd at the US National Championship with a Darkrai EX/Mewtwo EX deck. Flash forward to the World Championships and the most popular deck in the tournament was Darkrai/Mewtwo with two of them meeting in the finals. I think M Rayquaza decks will go through a similar process. At the initial Regional Championships the standard speed versions of the deck will be the most winning as it is what players are flocking to. As foreign National Championships and the US National Championship unfold, new versions of the deck will make their debut, and by the time the World Championship has concluded, I think we will be looking at a new twist on M Rayquaza as being the best version. 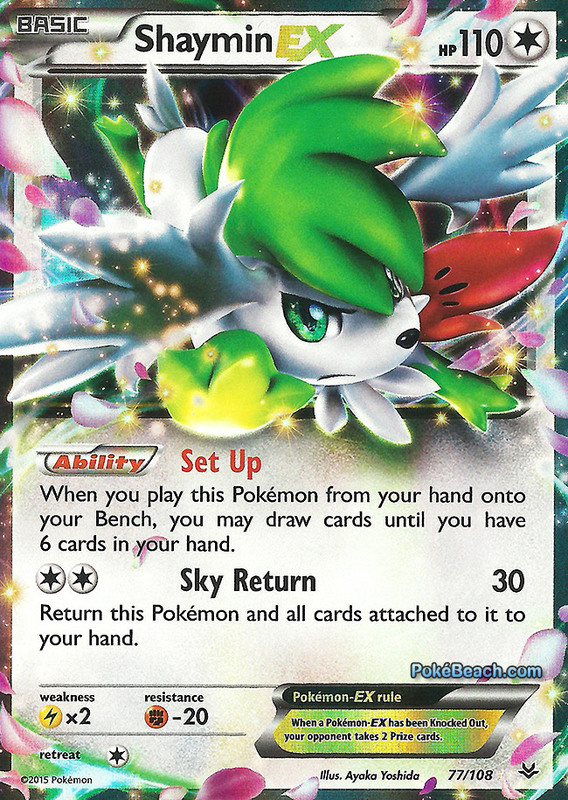 Finally, the top card from the new set is none other than the much hyped Shaymin EX. Shaymin EX is a Basic Colorless Pokemon with 110 HP, a Lightning weakness, and a Fighting resistance. Its attack, Sky Return does 30 damage for [C][C] and returns Shaymin EX to your hand. Its Ability, Set Up, lets you draw cards until you have 6 cards in your hand when you play Shaymin from your hand to your bench. Set Up instantly becomes one of the best Abilities in the game as getting extra cards of draw for your turn beyond your Supporter cards is always very strong, and Shaymin EX does it as good as the best (Delphox XY) while being super easy to get into play. If you play 4 Shaymin EX to your bench you could draw up to an additional 24 cards during your turn and that’s before even taking into account Super Scoop Up shenanigans. Having reliable Pokemon draw which can be searched out via Ultra Ball or Repeat Ball (once a Shaymin EX is already in play) will really boost the consistency of all decks. It should single handily kill the Exeggutor Supporter lock deck as well. The attack is very solid too. As long as you have a Double Colorless Energy in hand or some form of Energy Acceleration you can use Sky Return to return Shaymin EX to your hand. This is useful to pick up Shaymin EX from your field if its the only thing that can lose you a game and also if you’re in a situation where you’re dead drawing and need to get some draw going again. I think an early mistake players may make when playing Shaymin EX is not thinking through their deck fully. When playing Shaymin EX to draw additional cards to create a card advantage you also want to be creating a board position advantage with those extra cards. When played correctly, Shaymin EX will be forwarding a strategy in a meaningful way through that card advantage. I’ve seen a lot of decks whose main focus just seems to be drawing through their deck as fast possible while not actually doing much of anything with that extra draw. While Shaymin EX is very strong and will be able to create a solid card advantage for everyone that plays it (which will be most players), there are some pretty strong counters in the format. Silent Lab, Wobbuffet, and Garbodor can all be used to shutoff its Ability. Additionally, since it has a low HP, strategies can be formed solely around knocking out Shaymin EX’s for your prizes against decks that rely heavily on Shaymin for draw. Shaymin EX will definitely see a lot of play with some decks playing 4 copies to fully draw through their deck, while some players will just play a single copy for an Ultra Ball out for draw. Not every deck will play Shaymin EX, but most of them will. Roaring Skies is an amazing set that will come in and shake up the current meta game instantaneously. It all starts with the big two in the set, M Rayquaza EX and Shaymin EX which will combine to form one of the strongest archetypes we’ve seen in a long time. The meta game surely won’t be completely dominated to the point where every round is a Rayquaza mirror match, but it will be such a strong deck that it pushes a major meta game shift changing the types of decks that are viable. The support for Dragon Pokemon in the set is equally impressive and various Dragon decks should instantly shoot up to Tier 1, or at the very least high Tier 2. Beyond that there are a lot of really neat Abilities and attacks on Pokemon in this set which don’t have obvious immediate uses, but are full of potential to be make a mark on the game at some point during their lifespan. I think this format will be much more fun than the States format is. Removing the Exeggutor lock deck as being a top tier deck from the format in itself will make the format much more fun. Seismitoad will still be good, but it will be nice to only have to really worry about Item lock, and not Supporter lock as well.